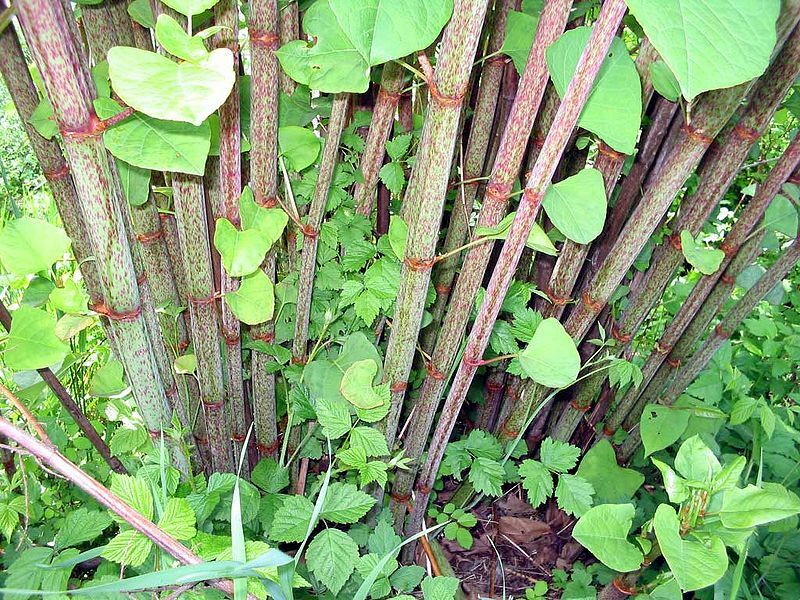 Japanese Knotweed, or Fallopia japonica, is now an invasive weed that grows all over the earth. It’s stems and new shoots look similar to bamboo, though it is not related, while its leaves are much larger than bamboo leaves and are oval with truncated base. The new shoots can be harvested as a spring vegetable while there is not much else available yet for wilderness survival, and the roots can also be eaten or used to make tea that is said to have medicinal benefits. Japanese knotweed can be found all over the world now, and usually grows near the edge of woods, roads, or on the sides of rivers. It can be distinguished from bamboo when no vegetation is present yet by breaking it. While it is hollow like bamboo, it is not nearly as strong. Later it will produce oval leaves and flowers that bamboo does not produce. When the new shoots are still tender and only a few inches from the ground, they can be eaten raw. The roots, when they are yellow or orange can be cooked and eaten or made into a tea. The roots are rich in resveratrol, which has not been clinically proven to have health benefits but is available in health food stores and has been used for centuries to treat illness. It is said to support heart health, fight cancer, and help prevent Lyme’s disease. Japanese knotweed’s main importance in survival is that it produces eatable vegetation, even in colder climates, long before other plants do. The more sources of wild food that you know of, and can properly identify throughout the year, the greater your chances of survival are. Chances are, if you look along hiking trails and streams in your area, you will be able to find Japanese knotweed.